When you click the Active Survey or Active + Passive button in the survey type selection dialog, an additional configuration dialog is displayed as shown below. This dialog allows you to configure TamoGraph for an active survey you are about to conduct. If your computer has only one Wi-Fi adapter, you cannot change the default selection; that adapter will be used for the active survey. 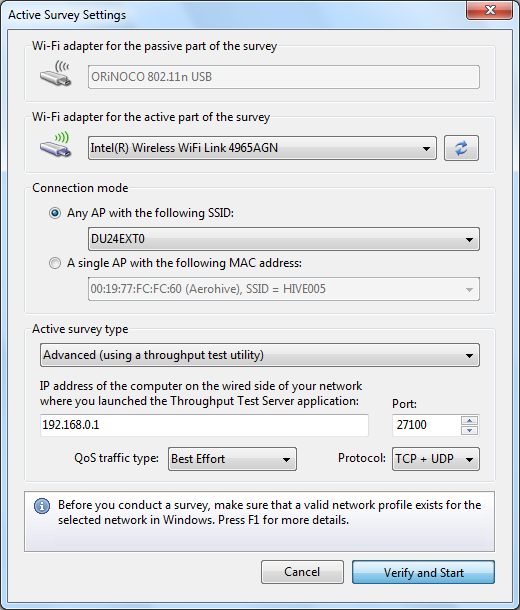 If your computer has two Wi-Fi adapters and you are conducting both survey types simultaneously, in the Active + Passive mode, you cannot change the default selection, either; the adapter that is compatible with passive surveys will be used for the passive part of the survey, while the other adapter will be used for the active part of the survey. If your computer has two Wi-Fi adapters and you are conducting an active survey only, you can select either of the two adapters. We recommend that you use the integrated adapter for active surveys. For example, if your laptop comes with an integrated Wi-Fi Intel adapter and you also use a Wi-Fi USB adapter, select the integrated Intel adapter. Please keep in mind that the WLAN metrics that are measured during an active survey depend on the capabilities of your adapter. If your adapter's capabilities are inferior to the capabilities of your WLAN, this will be reflected in the results obtained during the survey. For example, if your APs support the 802.11n standard with the maximum rate of 300 Mbps, whereas your Wi-Fi adapter is a legacy 802.11g device with the maximum rate of 54 Mbps, the measured PHY rate and throughput rates will never exceed 54 Mbps, thereby giving you an underrated picture of the WLAN performance. There are two connection methods for performing active surveys: the SSID method and the MAC address method (also frequently referred to as the “BSSID method”). 1.The SSID method allows the client to associate to the selected SSID and roam between multiple APs that share the selected SSID. This mimics real-world client roaming behavior. Note that some adapters let you adjust roaming thresholds; these roaming settings might affect the performance data. 2.The MAC address method locks a client into the MAC address of the AP and prevents the client from roaming. This allows you to analyze the connectivity zone and performance metrics of a single AP. Note that for the MAC address method to work, support of this functionality is required from the operating system and the driver. The combination of the adapter model, OS, and the driver determine whether this method will work. If TamoGraph notifies you that this method is not supported, use the SSID method and create a temporary SSID specific to a single AP, which will let you bypass this problem. Which of the two methods you choose depends on the specific purposes of your survey. The first method is typically used in post-deployment scenarios, while the second one is typically used on the deployment stage. If you use the first method, select the desired SSID from the drop-down list. If your WLAN doesn't broadcast its SSID, select the <Non-broadcast SSID> item and you will be prompted to choose the network profile for that WLAN at a later stage. If using the second method, select the desired AP from the drop-down list. When TamoGraph is not running, make sure that the client adapter you plan to use for active surveys can connect to the AP(s) and/or SSIDs you plan to connect to during an active survey. This must be a single-click connection right from the Wi-Fi system icon of Windows or macOS. You must not be prompted for any additional credentials. If a username or password is required, they must be cached by Windows/macOS. If other authentication, such as a smart card, is required, it too must be performed without requiring any user input. Using third party authentication supplicants is not supported; the OS must be able to complete authentication by itself. In other words, a valid network profile for the given WLAN and the selected client adapter must exist in the OS. Sometimes existing WLAN security configuration does not allow you to associate under the conditions described above. In such cases, we suggest that you create a temporary SSID with no or WPA-PSK security. Create a firewall rule to prevent clients using that temporary SSID from accessing any important intranet resources and delete that temporary SSID when you are done with the survey. Once an active survey has been started and the client associated to a WLAN, TamoGraph begins to measure client performance. You can select the Basic or Advanced active survey type. In the Basic mode, the client sends pings to the computer on the wired side of the network at the specified IPv4 or IPv6 address. This mode is the easiest to configure: Simply enter the IP address of a host that can respond to ping packets (this may be a computer or other ping-capable type of hardware, e.g., an AP.) Make sure that the firewall rules on the client side and the host side permit ping (also known as ICMP) request and response packets. The drawback of the Basic mode is that no data throughput measurements can be performed. Only the following visualizations will be available: Actual PHY Rate, Round-trip Time, Associated AP, and Requirements. In the Advanced mode, TamoGraph connects to a throughput test server utility on the wired side of the network at the specified IPv4 or IPv6 address and port. During the survey, TamoGraph is continuously sending and receiving packets to/from the server utility and records performance data. This mode is a bit more difficult to configure, but you get much more data as a result of throughput testing. In addition to the Actual PHY Rate, Round-trip Time, Associated AP, and Requirements visualizations, you also get TCP Upstream and Downstream Rate, UDP Upstream and Downstream Rate, and UDP Upstream and Downstream Loss. The only additional step required to use the Advanced mode is copying the throughput test server utility from the computer where TamoGraph is installed to the host on the wired side of the network and running the utility. On Windows, the utility executable file can be found at C:\Program Files\TamoGraph\ThroughputTest\TTServer.exe on 32-bit Windows or C:\Program Files (x86)\TamoGraph\ThroughputTest\TTServer.exe on 64-bit Windows. Copy this file to a host running Windows and launch the file. You will see the utility window as shown below. Alternatively, the throughput test server utility for Windows or macOS can be downloaded from our Web site at http://www.tamos.com/products/throughput-test/. It is part of our freeware product, TamoSoft Throughput Test. Install the product and use the Run Server command. You are now ready to start an active survey. Always start active surveys when you are close to the AP your client will connect to, in the area where the signal level is high. This will allow the application to quickly validate the settings and start data collection. DO NOT start active surveys in the areas where the signal level is insufficient for stable connectivity. Click Verify and Start to proceed. If you are not an advanced user and not familiar with the concept of QoS, you do not need to read this chapter; just leave the default Best Effort selection in the QoS traffic type control and begin the survey. Advanced users might want to use the QoS traffic type control to specify the Quality of Service traffic type that will be associated with the TCP and UDP data streams that are sent and received by the application. A description of the use of QoS and related standards and technologies, such as WMM, 802.11e, DSCP, and 802.11p, is beyond the scope of this manual, but in brief, you might want to use this functionality to check how different QoS traffic types affect throughput. In a properly designed WLAN that uses enterprise-class APs, throughput values for high-priority traffic should exceed those for normal-priority traffic. The table below summarizes different QoS traffic types that may be used. Please pay attention to the fact that not all the QoS types available in the application and described below have corresponding WMM access categories. In practice, this means that when you select a QoS type that has no WMM mapping, your Wi-Fi adapter driver might fail to QoS-tag packets at all. This traffic type is the same as not specifying priority, and as a result, the DSCP mark and 802.1p tag are not added to sent traffic. Corresponds to the WMM AC-BE access category. Sent traffic will contain a DSCP mark with a value of 0x08 and an 802.1p tag with a value of 2. Corresponds to the WMM AC-BK access category. Sent traffic will contain a DSCP mark with value of 0x28 and 802.1p tag with a value of 5. This does not correspond to any WMM access category. Sent traffic will contain a DSCP mark with a value of 0x28 and an 802.1p tag with a value of 5. Corresponds to the WMM AC-VI access category. Sent traffic will contain a DSCP mark with a value of 0x38 and an 802.1p tag with a value of 7. Corresponds to the WMM AC-VO access category. Sent traffic will contain a DSCP mark with a value of 0x38 and an 802.1p tag with a value of 7. This does not correspond to any WMM access category.